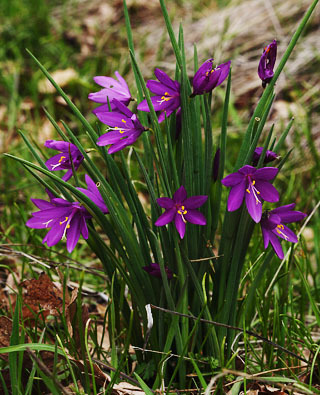 also called Purple-Eyed-Grass or Satinflower. Six tepals all alike, magenta, ¼–¾” long [6–20 mm]; 3 stamens fused together for less than half their length; flowers 1 or a few; leaves grasslike, near-basal (plus two bracts at base of flower stalks, one of which may look like stem continuing above the flowers) shorter than the 4–12″ [10–30 cm], 2-edged stem. Habitat: Dry grassy sites that are briefly moist in spring; WA, OR, w ID, sw BC. Natural History: This brilliant color spot is a “spring ephemeral,” meaning that it completes its active season in wet soil in a few weeks of spring, then withers into near-invisibility for the rest of the year. It draws wildflower buffs to the area east of Bingen, on the Washington side, around the beginning of February, for their first thrill of spring. It can be seen a little later in many parts of the Gorge. It is named for David Douglas, the patron saint (if it were up to me) of Northwest backpackers. Time and again he set off into the wilderness, usually with native guides or Hudson’s Bay Company trappers, but also often alone. He packed a cast-iron kettle, a wool blanket, lots of tea and sugar, tobacco and vermilion dye as trade items, his rifle and ammunition, and pen, ink, and reams of paper for wrapping plants, seeds, and skins—no shelter usually, no dry change of clothes, no waterproofing but oilcloth for the papers and tins for the tea and gunpowder. Often without food in his pack, he might eat duck, venison, woodrat, salmon, or wapato roots; other days he consoled himself with tea, and berries if he was lucky. Once while boiling “partridge” for dinner, he fell asleep exhausted and, waking at dawn to a burnt-through kettle, counted himself clever to boil up a cup of tea in his ­tinderbox lid. He approached each Native American as a potential friend, accepting his dependence on them for food, information, or portage while also knowing some of them would rather kill him or steal than barter for his goods. “They think there are good and bad spirits, and that I belong to the latter class, in consequence of drinking boiling water and lighting my tobacco-pipe with my lens and the sun.” They probably didn’t intend to kill Man of Grass quite as many times as he thought. Douglas figured he walked and canoed 6,037 miles of Washington and Oregon in 1825-26. In 1827 he caught a ride on the Hudson’s Bay Express, an annual shipment of furs involving many voy­ageurs on established routes, with canoes, horses, and outposts waiting for them at several points along the way. The Express crossed the Continental Divide at Athabaska Pass, a pass that was never chosen for a road or railroad, and sees few people today. The express followed the Saskatchewan River to Hudson’s Bay, where Douglas caught a ship back to England. For this entire voyage, the Royal Horticultural Society paid Douglas their going rate, £100 a year plus £66 for expenses. His mission was to ship them seeds or cuttings to grow lucrative exotics in English gardens. He enjoyed minor celebrity in London at first, but soon ran into the proverbial difficulty in keeping his head above water in high society. He undertook a still more ambitious plan to trek from Northwest Mexico to Sitka, Alaska, catch a ship from there to Kamchatka, and thence hike back to Europe. He did cover central California, the Columbia region again, and BC to north of Prince George—losing all his notes, journals, and instruments in rapids on the upper Fraser—before sailing to Hawaii where, at the age of 34, he came to a gruesome end. Out walking alone with Billy, his faithful Scotty dog, he was gored and trampled in a pit trap for feral bulls. Did he fall, or was he pushed? Rumors that he was pushed persist to this day.